Domain knowledge is valid knowledge used to refer to an area of human endeavor, or other specialized discipline. A subject-matter expert (SME) or domain expert is a person who is an authority in a particular area or topic. A thought leader is an individual or firm that is recognized as an authority in a specialized field and whose expertise is sought and often rewarded. Military doctrine is a body of thought on how military forces intend to operate as an integral part of a joint force. Doctrine focuses on how to think—not what to think. It is a guide to action, not a set of fixed rules. It combines history, an understanding of the operational environment, and assumptions about future conditions to help leaders think about how best to accomplish missions. 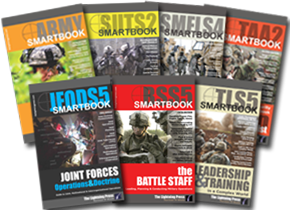 It provides an authoritative guide for leaders and Soldiers but requires original applications that adapt it to circumstances. Doctrine should foster initiative and creative thinking. Doctrine establishes a common frame of reference; including intellectual tools that military leaders use to solve military problems. It is a menu of practical options based on experience. By establishing common approaches to military tasks, doctrine promotes mutual understanding and enhances effectiveness. It facilitates communication among Soldiers and contributes to a shared professional culture. By establishing a commonly understood set of terms and symbols, doctrine facilitates rapid dissemination of orders and fosters collaborative synchronization among units. It establishes the foundation for curricula in the Military Education System. Military doctrine forms the basis for training and leader development standards and support products. Training standards provide performance baselines to evaluate how well a task is executed. Together, doctrine, training, and resources form the key to military readiness. Doctrine consists of fundamental principles; tactics, techniques, and procedures; and terms and symbols.